Agile software development refers to a group of software development methodologies based on iterative development, where requirements and solutions evolve through collaboration between self-organizing cross-functional teams. Agile methods or Agile processes generally promote a disciplined project management process that encourages frequent inspection and adaptation, a leadership philosophy that encourages teamwork, self-organization and accountability, a set of engineering best practices intended to allow for rapid delivery of high-quality software, and a business approach that aligns development with customer needs and company goals (cPrime, 2018). This definition of Agile is closely related to software development, but it is being implemented in many companies outside of the IT sector for several different projects. It is truly a buzzword at the moment. But really, we act as if it something new, but we used to talk about being LEAN and now its Agile. It used to be top-down, now we have to connect with people on all layers in an organization. We have to use the human capital to the fullest. 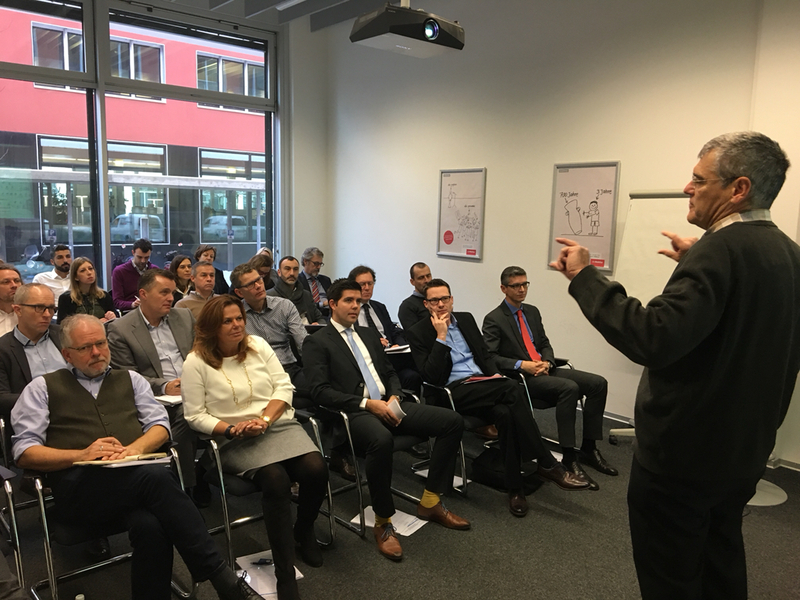 Eurapco recently held a multilateral on the Agility and Scaled Agile Framework topic. Although initiated by the ICT group, they quickly realized this is not just an ICT topic. They involved members of several departments such as portfolio management, Human Resources and many others. All Partners participated and got value out of this exchange of best practices. I think part of implementing agile is also about awareness process at the top of organizations. In the new world, leaders have to engage employees and be ready to take some risk. Agile is also about giving people responsibilities, while monitoring the result. How cool that each individual has its own responsibility and we can create more results together as a whole. It makes every individual visible for their achievements. Everyone has its own way of living and working and Agility makes this possible, in fact, it makes it even more necessary for us to be flexible and for people to shine in their own style of working. We don’t decide anymore what the best way of working or learning is for an individual. Instead of measuring how an individual is doing things, we measure the value they make. We ask individuals to show what they achieved. It also gives space to people. With this comes risk. Risk is as much part of the new world as of the old world. Leaders in the old world and leaders today have had and still have to try, learn and improve. Much more developed in America than Europe is the culture of failing. For Agility to work we have to give people space to make mistakes and to try out new things. Risk is necessary in this process. I think as leaders and as companies we should not be scared of this. Embrace people’s productivity. Another hot topic in the market is employer branding. I believe agile companies are also good employers. People get the space to be themselves and deliver results, which makes work more fun for employees. On top of that, colleagues get to know each other, with ups and downs of course, but they get a much better understanding of who a person is and how they like to work. I think true leaders of agile companies are stars at creating engagement with employees. What do you think of the agile process? Do you already apply it in your daily work? Excellent expression of what agile can mean for companies if they dare to apply it broadly. In my practice as trainer I use Assembly Benefit Bonus. The Assembly benefit Bonus is one of the most important outcomes of real team work. The principle; with a group you cycle faster than alone. This is of course only true if you really work together as a team. work together in all ranks. In a culture where you can make mistakes and admit mistakes. Thanks for your comment. I think with agile it’s about finding the balance between an individual’s responsibility and true team work. Like you said, you have to work together in all ranks!